I don’t have a pug. Can I still attend? Of course! You do not need to have a pug in order to participate in the festivities. We love dogs of other breeds as well, but they must be cool with the puggies. We are still working out the details, but some costs to prepare for include: lodging, food, and weekend events and festivities (including the party bus and conference). Please check back for more details. 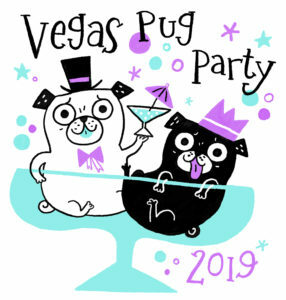 Are there rules for attending the Vegas Pug Party? Yes. Please see our Code of Conduct here. Are there any health requirements for bringing a pug/dog? Please make sure that all vaccinations are up to date, your pet has a current stool parasite exam, and as free of fleas and ticks. If your pug is ill and possibly contagious, please leave them at home. There are a lot of puggies and we want to keep them healthy! How do I donate to the raffle or auction? We love donations! It all helps to raise more money for pug rescue. To donate, please fill out the form on this page.